Panda bears are instantly recognizable with their black and white fur and fondness for bamboo. 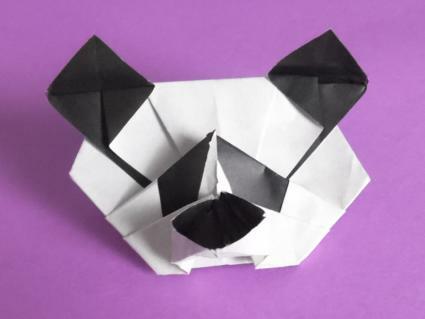 With a little creativity and the following instructions, you can make an origami panda that's almost as cute and cuddly as the real thing! 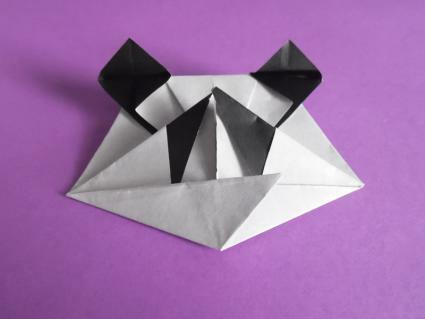 This traditional origami model is one of the easiest origami pandas to fold, although it does require familiarity with the squash fold technique. If you need a refresher, the Origami Resource Center has several diagrams demonstrating various squash fold placements. 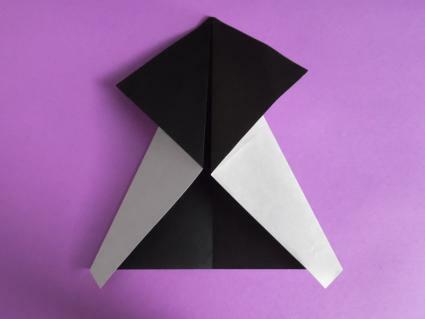 You will need a square sheet of origami paper that is black on one side and white on the other side in order to make your origami panda. Please keep in mind that larger paper tends to be easier for a beginner to fold. The paper used in this example is 6 inches square. To begin making your panda, start with the black side of the paper face up. 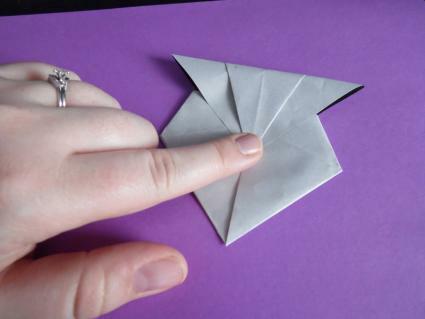 Fold in half horizontally, then unfold. Fold in half vertically, then unfold. You should now have four equally sized squares on your paper. Flip the paper over so the white side is face up. Fold the left and right sides in to meet the center crease. Flip the paper over. Fold the left and right sides in to meet the center crease, folding on the front layer only. Make a horizontal valley fold to point the top of the black diamond shape down. Valley fold the left and right corners of the paper. Unfold each of these creases, then use them to make an asymmetric squash fold. When finished with this step, you'll only see the white parts of your paper. Valley fold the top left and right portions of the paper that you applied a squash fold to in the previous step. This will create two black eyes for your panda. 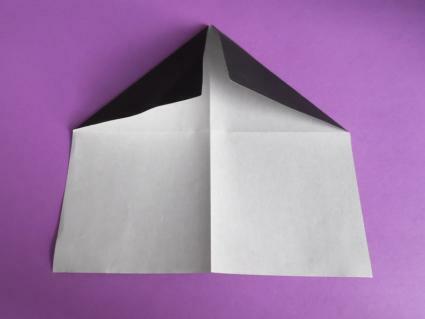 If the eyes aren't symmetrical, unfold the paper and try redoing your squash fold. Fold the left and right sides of the top portion of the paper in to meet the center crease. Make symmetrical squash folds on each side. Make a horizontal valley fold that goes across the middle of each diamond created by the squash folds. This brings up the colored layer of the paper, creating black ears for the panda. 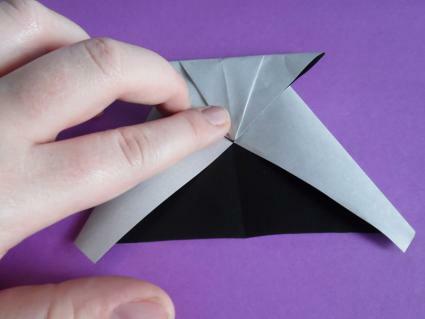 Make a rabbit ear fold across the bottom triangular portion of the paper. A rabbit ear fold pinches a corner of the paper to make a new fold that looks a bit like a rabbit's ear. Fold the bottom left and right corners of the paper backwards to round out your panda's face. Slightly open the pocket created by the rabbit fold to make the nose of your origami panda. If you're ready for a challenge, this origami panda designed by noted paper folder Robert J. Lang is a full body model. The video tutorial is provided by Jo Nakashima with permission from Mr. Lang. Golden Venture Folding, also known as 3D origami, involves joining folded paper triangles together to make a 3D sculpture. 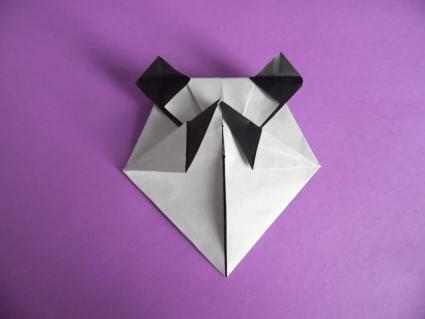 Watch this video to learn how to make a panda from 450 white and 378 black folded triangle units. Origami pandas, like many origami animal and bird models, require practice to be able to fold accurately. Don't get discouraged if your first few pandas look a little lopsided. With patience and persistence, you'll eventually figure out a folding technique that works for you.